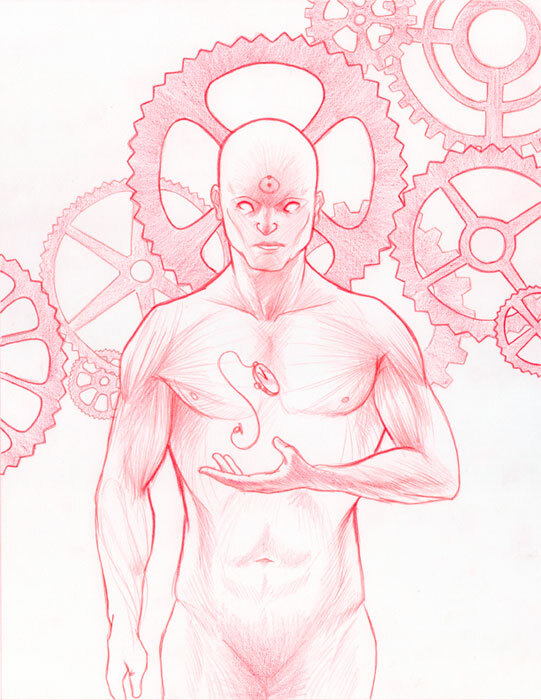 Here's the finished drawing for my Dr Manhattan piece that I'm contributing to a show of Watchmen characters. It's a cool opportunity and I can't wait to see the show. It took a while to pick from the characters but a reread of the book gave me this clear mental image. That, and it gave me to chance to add gears to a piece- I wanted me some gears. Much of my reference in this piece came right out of a couple of anatomy text books. I figure that Dr Manhattan would have some sort of ideal, constructed, or mechanical body- a true machine of a man, seeing as how his character is steeped in logic, science, and the ability to mold the molecular structures of, uh, everything. The finish should be fun so here's to everyone else who's working on the same show.